Japanese engineers have come up with a robot that can copy the moves of a samurai sword master and then beat his “teacher” in a fight. The samurai machine carries out hard-angled cuts with speed and precision – without breaking sweat. Among the robot’s most spectacular accomplishments is a party trick: being able to slice a runner bean lengthways. 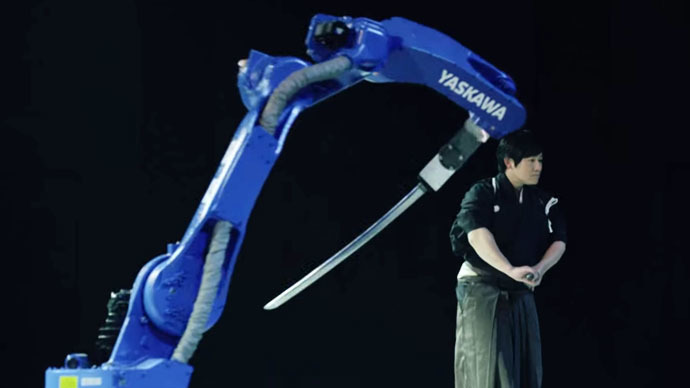 The robot competed against renowned Japanese swordsman Isao Machii, from whom it learned how to fight by motion capturing his moves. Machii can slice a fried shrimp fired at him at about 130 km per hour, according to The Independent, but he still lost his swordfight against the machine. Robot arms, which have truly amazing skills, have recently entered the spotlight: one beat a world table tennis champion in March, while Russian military robots scored high at a shooting challenge a month ago during field training. In April, a UK company unveiled a robo-chef capable of preparing meals from scratch.